Find your matching bike saddle bag for your road or MTB bike here. In this case, it does not matter which bike type you are since we all like it practical. They are quickly fastened, do not disrupt and do not weigh much. Small saddle bags have a volume from a tiny 0.3 litres or 0.5 litres (sufficient for small stuff) to larger bags with 1.4 litres or 1.9 litres (here, you can also stow away your mobile phone or the wind jacket). You'll typically transport small tools with a small saddle bag, such as CO2 cartridges, tyre lever, repair kit or the key ring, small change or one or two hoses. They are helpful and practical if you want to do without your backpack on short tours or when you are a road biker, you anyway won't be on the road with ballast on your back. Furthermore, there are "seat post bags", which can take quite a lot more (approximately 6 litre bags), for example the Off Road Bag from VAUDE. When making your buying decision, you have to take into consideration which size you need so that the look of the bag won't bother you too much, if applicable. And place emphasis on special features, such as for example the properties water-resistant (all the way up to waterproof) or the possibility to fasten a tail light/flashing light. For the retro fans among us, Brooks offers saddle bags in the popular retro design, if you wish, you can also get them made of leather, and if you like it practical, Topeak offers the complete saddle bag inclusive tools. Be careful at seat posts which can be lowered: Trail fans, who ride on sigletracks with seat posts which can be lowered, probably are not among the target group for saddle bags. But an especially small bag, which also looks quite good (e. g. a small Evoc 0.7 litre saddle bag) is compatible with a height adjustable seat post as well. If the bag is larger and has an additional fastening on the seat post, they could get in each other's way. 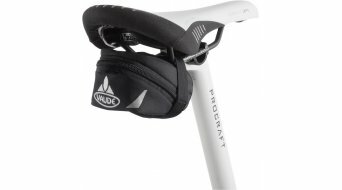 As a rule, the saddle bag is fastened with Velcro fasteners or straps underneath the saddle: Just mount it to the saddle rails and often additionally to the seat post for an optimal hold. Ortlieb for example offers special saddle holders (a small plate with two simple screws), where the bag can very easily be clicked in. Specialized, who recently started to ensure small stowage space in the bike with their SWAT system, also offers similar solutions. A saddle bag, which especially fits SWAT-compatible seats is also part of the SWAT series. 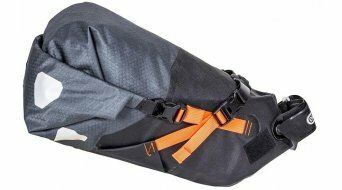 Numerous manufacturers, such as VAUDE, Ortlieb, Evoc, Topeak, Deuter, Specialized or Bontrager offer saddle bags. We have numerous bags in different sizes and looks in our range of products and offer you favourable prices, discover the selection now!